The box for the S5510 is rather generic. The only thing distinguishing what product lies inside is the side sticker that has the model number on it. It’s a server board. Utilitarian. We don’t need any stinking fancy graphics telling us what’s inside. After cracking open the box, the luscious motherboard filling lies inside. We can see that the motherboard only has PCIE x8 slots. So don’t expect to slam in your new heavy duty Radeon 6950 and go gaming away. That’s not what this board is meant for. This isn’t the kinda of motherboard to build a gaming rig around, the onboard graphics simply won’t support it (more on that later). 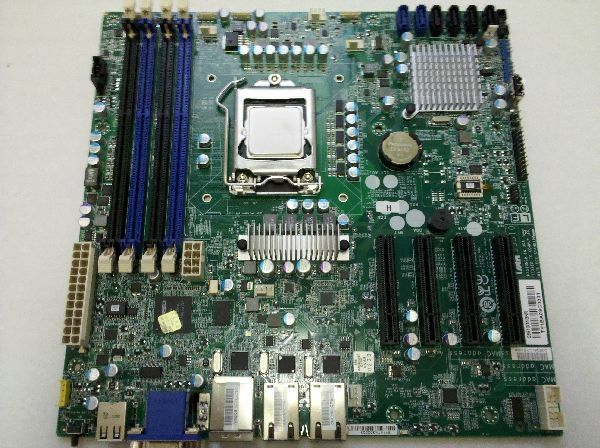 This is however the kind of board you would build around to host dedicated game servers for massive LAN events. 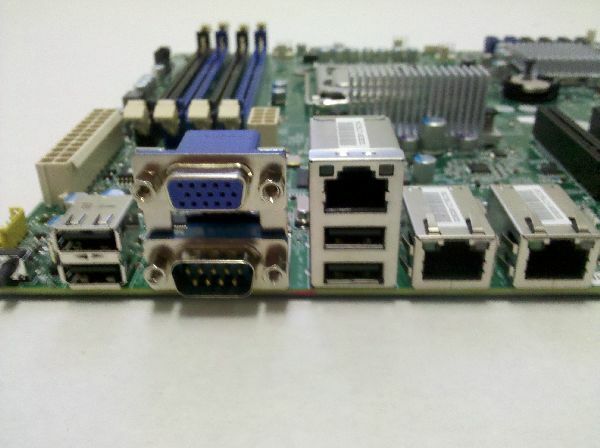 Even though the form factor is microATX, this board would not excel in a HTPC. This is once again due to the onboard graphics. They do make graphics cards that will fit in the PCIE x8 slots and give this board the capabilities of an HTPC board, but if you have to do that you’ve missed the point of buying a server motherboard. 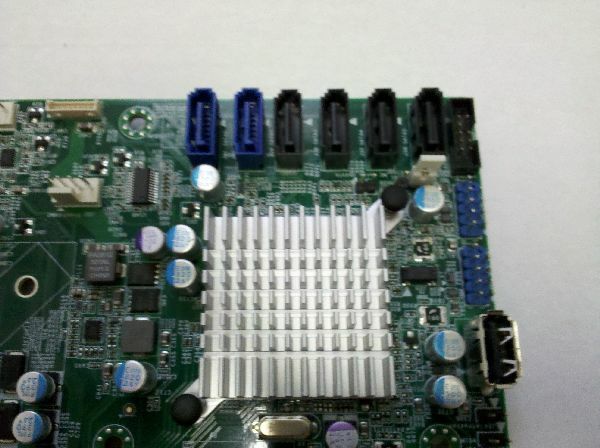 Here we can see the Cougar Point based S5510 is rocking 4 SATA II and 2 SATA III ports. This is pretty standard fare for Sandy Bridge based chipsets. Next to the 2 blue USB headers on the right of the image, you will see a USB port on the motherboard. This is useful if you wish to install the motherboard in an appliance like enclosure and have it boot directly off of the USB drive. 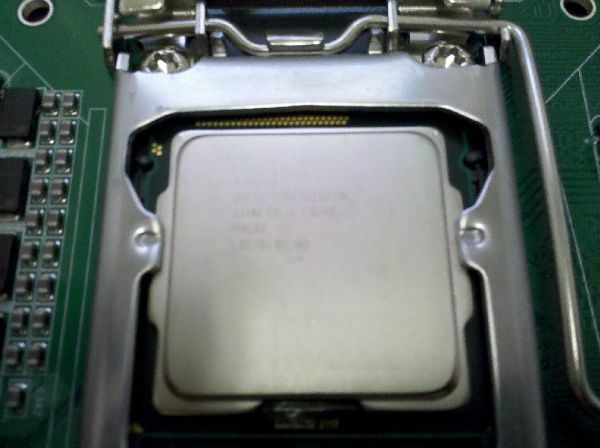 The chip that was included with our motherboard for testing is the Intel Xeon E3-1220. It is clocked at 3.1 GHz and has 8MB of Smart Cache. This particular chip doesn’t have the onboard graphics capabilities of other Sandy Bridge type chips, nor does it have Hyper Threading. It is a 4 core/4 thread style CPU. Like other Sandy Bridge based chips, the E3-1220 does have the new AES instructions. As we will see in some of our AES benchmarks later on, the enhanced instruction set allows the E3-1220 to blow the competition out of the water when it comes to AES computation. The IO ports on the S5510 look to be very sparse compared to any desktop motherboard. This is fine, as server boards are designed to be utilitarian and don’t need a million USB ports and 7.1 high definition audio among other bells and whistles. What a server board does need is good gigabit NICs (Network Interface Controller), which the S5510 happens to have 3 of. This makes the S5510 capable of doing some pretty fancy enterprise grade networking. Like any good server board, the Intel based NICs support link aggregation. This will allow you to load balance traffic between the NICs. The NIC closest to the VGA connection also doubles as the connection interface for the BMC, which allows the user to interact with the IPMI interface. The S5510 has an Aspeed AST 2150 for the onboard graphics. It’s not surprising if you haven’t heard of it before. This is a specialty graphics solution that is geared toward remote management of the system. It doesn’t contain the necessary components, such as pixel shader 2.0, for rendering 3D graphics. What it does have is the BMC that enables IPMI (Intelligent Platform Management Interface) remote management of the server. This allows users to remotely monitor and control the server through a web interface. 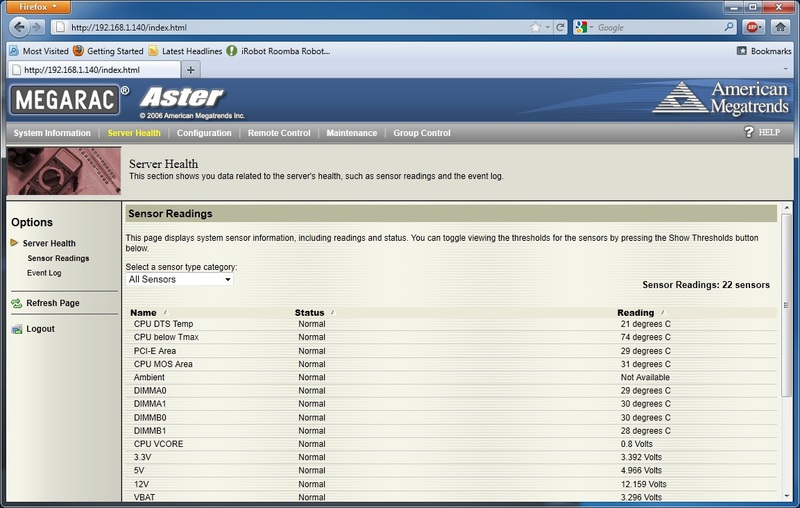 We can see in the two images above that the web interface allows you to monitor all sensor readings on the motherboard. The motherboard also has the capability to launch a Java applet that allows you to remotely control the server, even when it’s powered off or in the BIOS. The remote control Java applet also allows you to redirect local machine resources to the server. 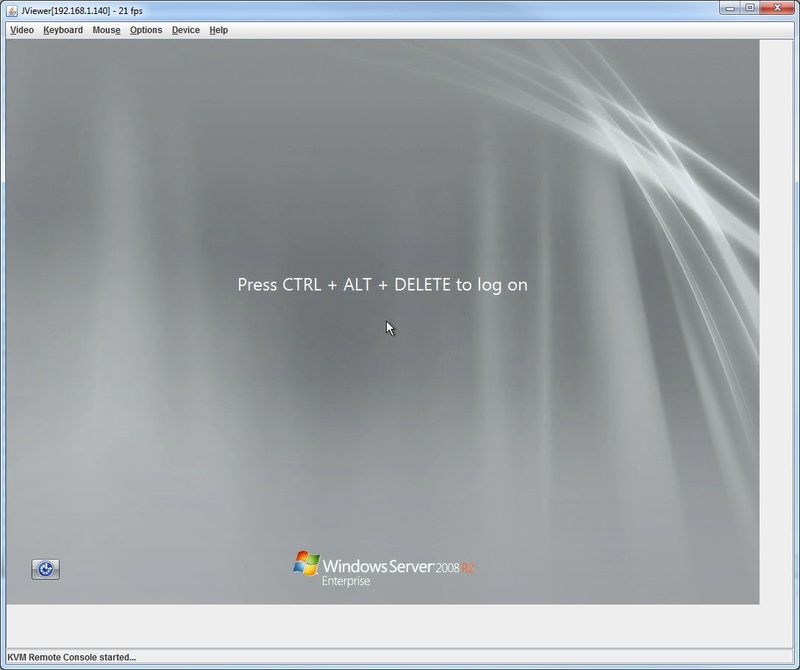 I was able to install Windows Server 2008 R2 from an ISO stored on a different machine to the machine running with the S5510 by using the console redirection applet. The motherboard emulates a DVD drive so the computer can install the operating system. This is a must have feature for any System Administrator.